Let me tell you a story about overdoing things. Dear sweet denim. Mistress of my dreams. Rapturer of my creative spirit. Beloved twill weave of cotton fibers, working its magic in ways that make us cherish it long after the piece has begun to deteriorate. This evidence of wear is the bait that drew me in, along with a delightfully faded blue color and extreme durability. I began working with its shades, its folds and creases, its recorded history. 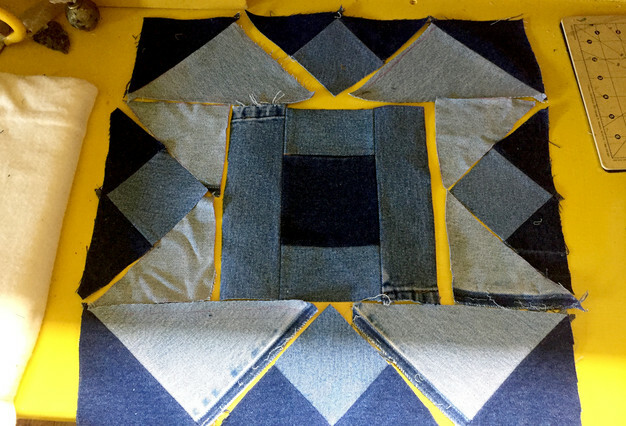 Creating quilts, jackets, redesigned jeans, I was completely in love. 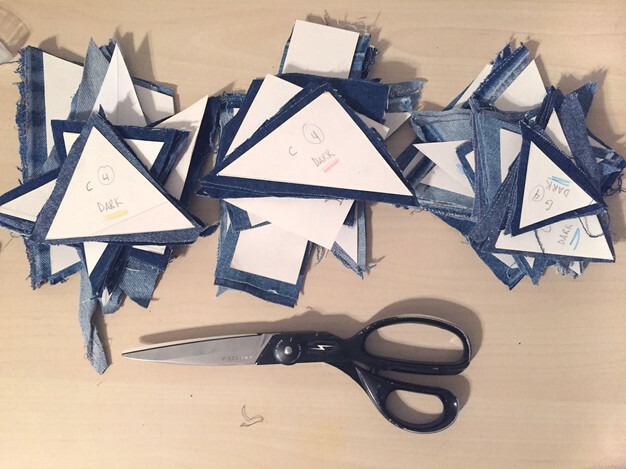 Then the projects began building up, and so did the piles of jeans. The fall of the denim avalanche came while living in our friends house late last year (yes we have the most amazing friends ever) who let me use their living room as my studio while they were at work from 8-5 everyday because, well, no one else was using it. Also their children were kind of obsessed with the sewing machine, so when they would come home, the kids would run over and sit next to me while I finished up, and the parents could get stuff done without having children tugging on to their legs. I get studio, kids get entertainment, parents get babysitter, everyone feels like a winner. So after months of denim on denim on denim, I crashed. Lugging boxes full of jeans divided by color (haha I wish! it was a total free-for-all) up and down daily drove me mad. The wear started to show, as it always does with denim, and when we moved into our place, the boxes went deep into a hallway closet, possibly never to be seen again. Then an order for denim bags came in. I pulled out the boxes (still not properly organized) and pretty much devoured the scraps whole. The results, once the bag order was finished, were a quadruplet of kaleidoscopic pillows that I decided to take a more organized route with and do precise patchwork on. 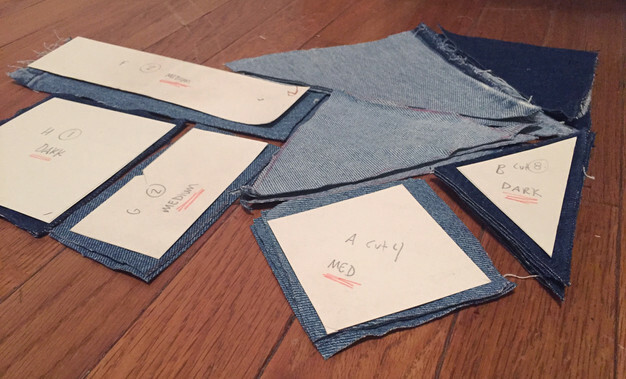 At so many points I thought I would need to go buy more jeans to get all the pieces cut, but since the nearest thrift store that is dependably open is about 40 minutes away, sorting through scraps was way quicker. 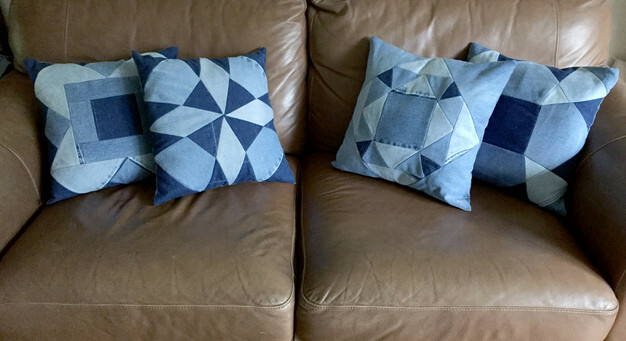 So, with all the scraps from the boxes, and plenty of time spent getting the perfect shape out of the nicest faded denim edge, I made these four adorable pillows. Below is a documentation of this process. Hoping to have these listed in the store by next week, there is a chance they will be one of a kind or at least made in very small batches, and folks on the newsletter get first dibs so go sign up, won'tcha? ?